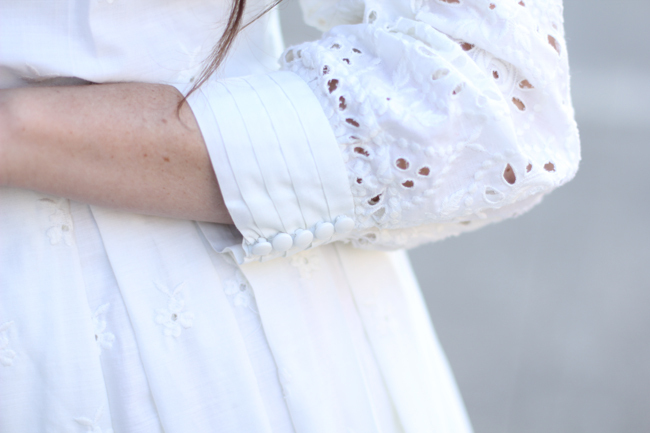 My favorite thing to wear will always be a pretty white dress, especially one with such amazing and intricate details as this vintage frock. 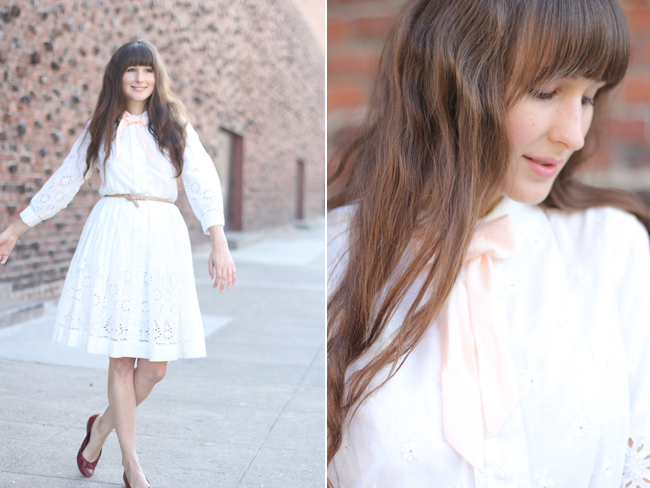 The pleating, the adorable pink bow, the rows of tiny buttons at the sleeve cuff... so much dreaminess! And it's just the perfect thing to spin around in before heading off to work. This is pretty much how all my photo shoots go down now: a few shots of me looking somewhat calm and serious, and then a whole bunch more where I'm smiling like a goon and jumping around. Because being serious is just no fun at all! I love the cut-out details on this dress! They make it such a pretty piece. You look dang good no matter what you're doing! Love this dress on you. Can't wait for brunch when I get back. You always have the best outfits Ashley! 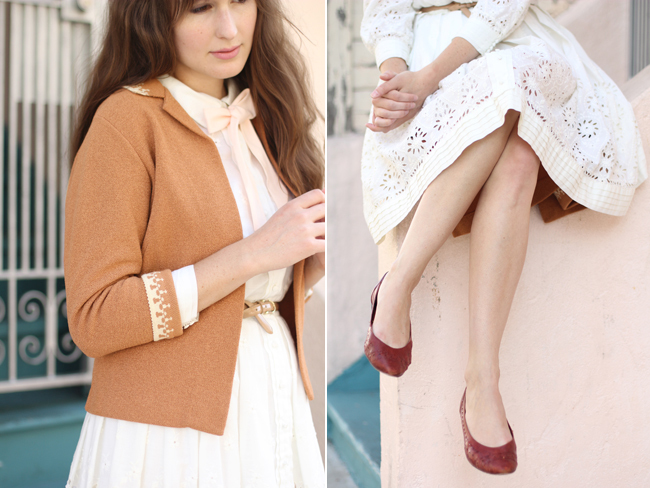 Your dress is so so so pretty, and the pink bow is the perfect touch <3 And I am obsessing over the cardigan too! Gorgeous gorgeous gorgeous! Heart, heart, heart these photos! You brought a smile to my face--you are darling and oh-so photogenic. I'm really excited that I found your blog and can follow you now! 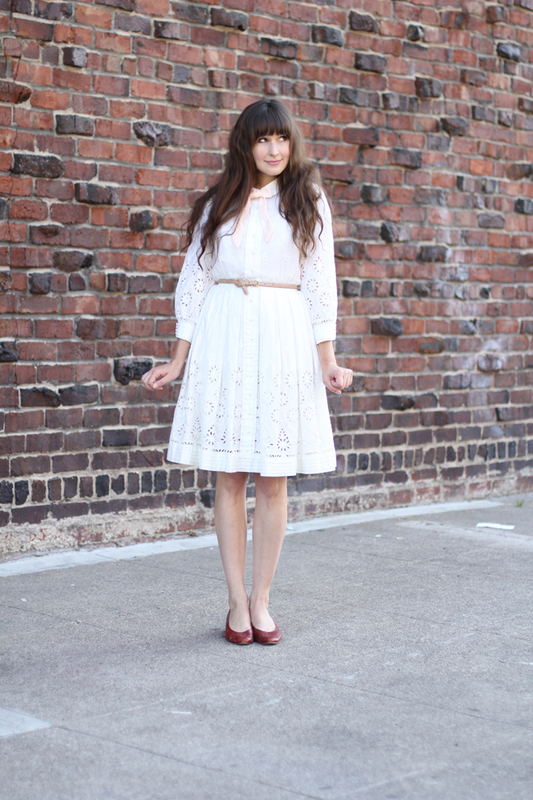 The cardigan is gorgeous and I love your choice of a skinny belt with this dress. adorable pink accents too. Oh my gosh, these are all so gloriously happy and adorable! I LOVE this post! So carefree & sweet. my goodness you're a beauty!! i want your hair on my head and that dress in my closet...love them both!! you always look so smiley and happy in your posts, it's refreshing!! that dress is unbelievably awesome! OMgoodness goodness, this is my favorite dress on you of all time (and I've seen quite a number of pretty dresses on you). 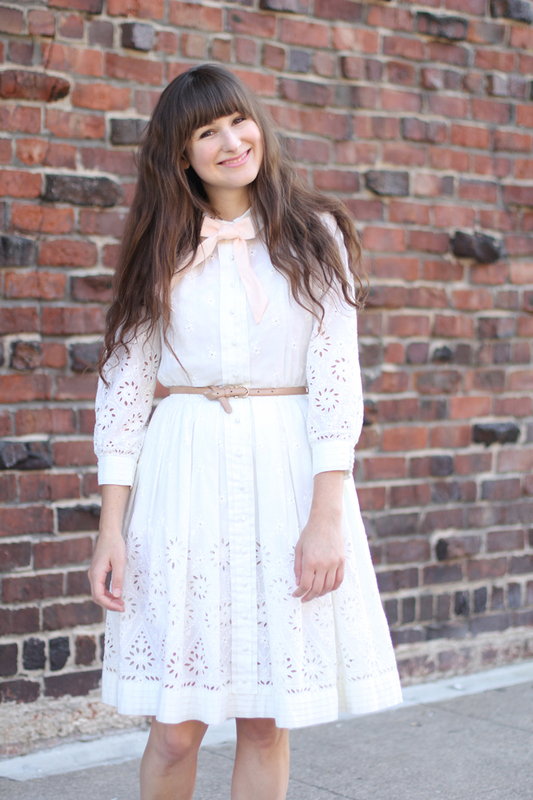 I love the simple white and eyelet detail. That bow is the icing on the cake! Very pretty photos, I love the one of you jumping! 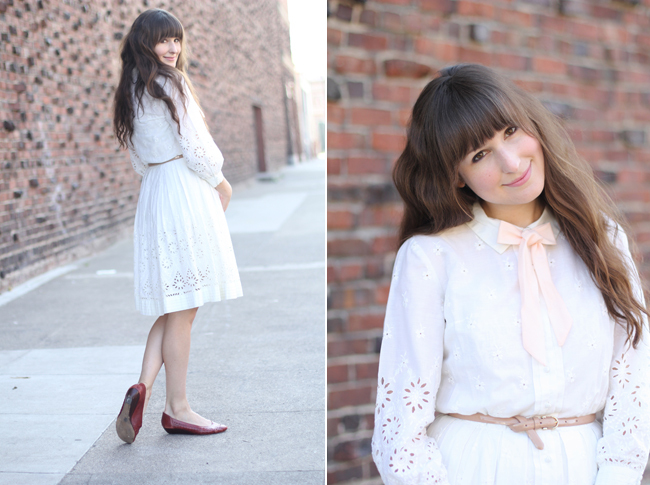 You have the most dreamy and pretty dresses ever!! 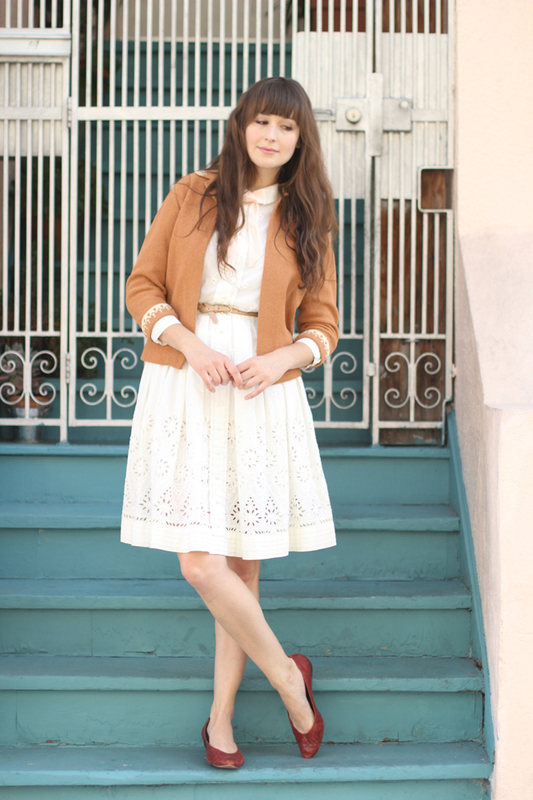 I am absolutely gah-gah over this one:) Plus you styled it perfectly! This dress is fantastic. I just love the little pink bow. what an incredible dress! I love everything about it, and the fact that it makes you so cheerful! so, so pretty! 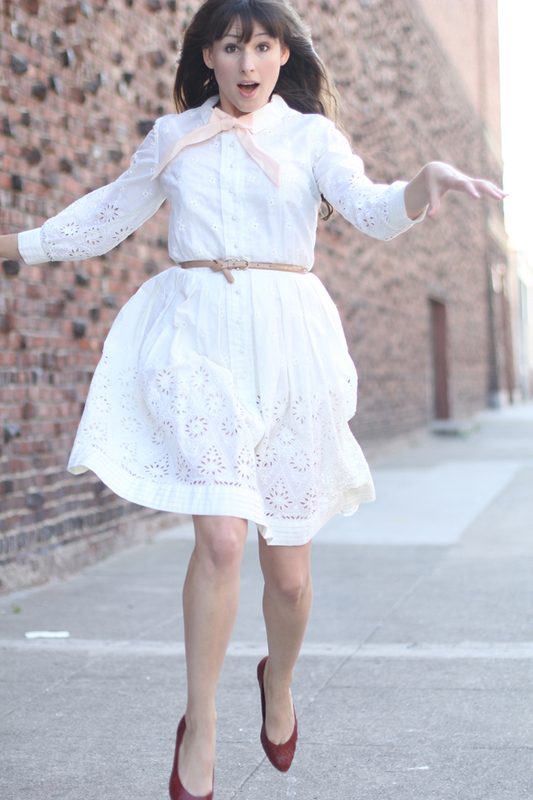 love this dress on you... the bow kills me! You are so awesome. I loved your costume in the previous post and then you switch over to this pretty dress which you look gorgeous in. Love your blog and I always look forward to your posts. these are SO cute its killin me! i love the baby pink bow! Ahhh your dress is so pretty! Beautiful photos as well. So pretty! 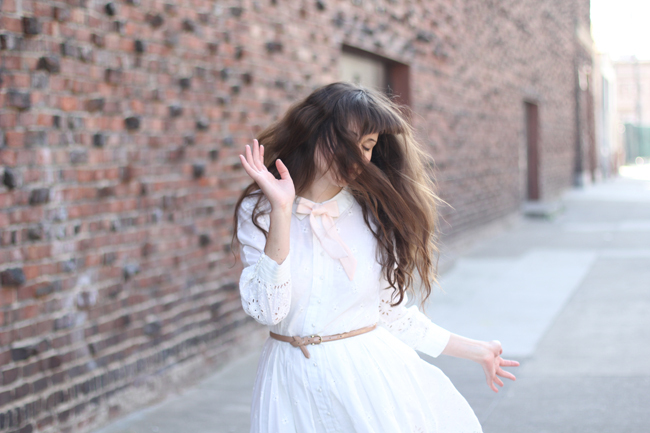 I love how feminine and whimsical these pictures are. 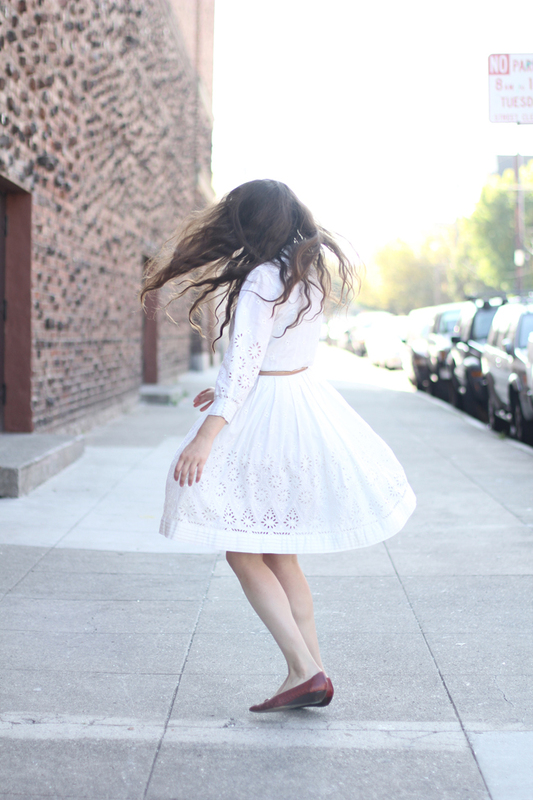 There's nothing quite like a white dress. Such a gorgeous dress for sure!! It looks even more amazing with the cardigan. Also, I love Isla. 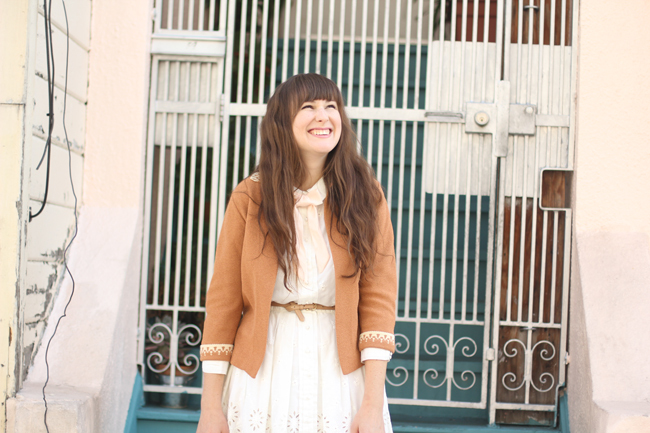 Her blog is so fun! What a truly gorgeous outfit this is. I love white.